Mutually assured destruction occurs when two forces who have heavily destructive weapons on hand threaten to deploy the weapons. In the case that these weapons were deployed both senders would be annihilated, therefore there is an understanding of mutually assured destruction. This occurred between the Russia and the United States. 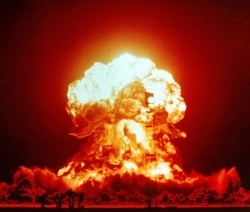 View Mutual assured destruction and over 3,000,000 other topics on Qwiki.